This past week I arrived home from work one evening to find a package in the mail containing the first game I’ve received from backing a Kickstarter campaign. Canterbury from Quixotic Games was successfully funded at just over $58,000, a relatively small game when compared to recent runaway Kickstarter hits like Zombicide: Season 2 at $2.2 million, All Quite On The Martian Front with just over $300,000 in funding and the current it-game Mars Attacks which looks to be cruising to a finish over a half-million dollars. As promised in the steady stream of updates from the game makers, Canterbury is an exceedingly well-manufactured board game with tons of sturdy cardboard playing pieces and typical colorful wooden markers. The game presents a board containing 25 districts, each with six building lots. 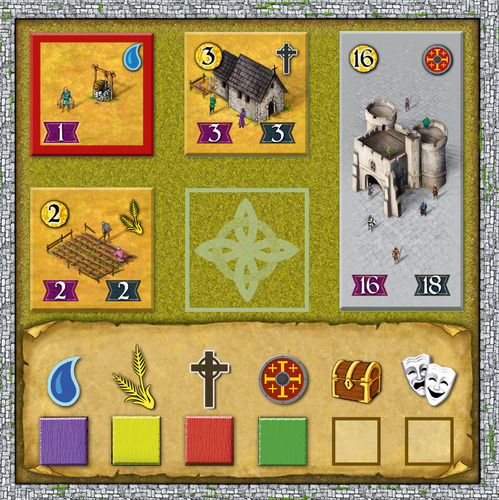 Each lot contains spaces to indicate water, food, religion, defense, commerce, and culture services which are provided as players build out the board. Beginning with a simple well providing water to the central district, players take turns performing one of three actions. A full build action allows 1-2 buildings to be constructed, depending on size and moneies available. Levying taxes gains a full monetrary collection based on the current economic strength of the entire kingdom, and a player using a levy play must perform on full build of 1-2 structures on their following turn. 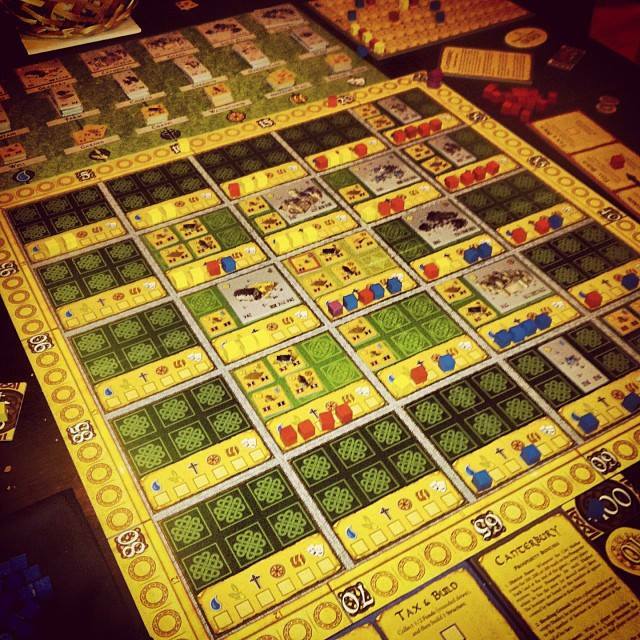 A third option allows a player to collect half the avilable taxes and build a single structure. Building and placing structures provide services to the board. A small, single-lot building gives that distruct the available service while a medium-sized two-lot building provides the service to that district plus the districts surrounding at right angles. The five largest structures are built at a high cost, cover four building lots and provide their service to the local district plus any five other districts on the board. Planning comes into play as buildings may only be built when previous services are available in a district. For example, religious structures may only be placed when the prerequisite water and food services are already present in the district. Previously-constructed buildings may be demolished to upgrade existing services or expand on already-provided services. There are lots of points to keep track of in Canterbury, adding up to many strategies toward winning at the game’s end. Erecting a structure gains points for the player as well as the kingdom, and players receive bonus points when breaking ground and building in empty districts. Once the kingdom passes the 100-point mark, players score “district favor” points based on the prominence of providing services to each district. Providing services also moves each player up an additional scoring track with those points scored at the end of the game. Points are again counted at the 200-point mark. Once the kingdom’s wealth takes three laps around the edge of the board to 300 points, the game ends with a final tally of points. The game is a bit lighter and faster than other civilization-building games I’ve played like Settlers of Catan, Civilization, Clash of Cultures and Village. That said, even with the brisk pace of the game, there’s a lot of strategy to be had. Players must always balance their own plays for points with the riches and services they are providing the kingdom (and other players) as a whole. Racing to provide services, build structures and gain an early lead on district favor points looked to be the key path to victory in the first game I played with my sons. Collecting and spending money at a balanced rate was also important since sitting on a pile of coins at the end of the game doesn’t provide much in the way of points. 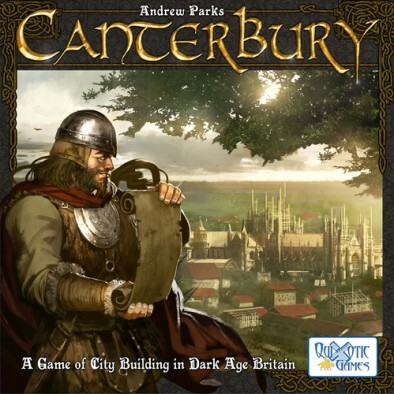 Like any civilization-building game, Canterbury strikes a great balance of real-world competitive and collaborative construction play. My older son thought injecting the game with random events like floods or droughts might spice up the straightforward play a bit, but overall the three of us really liked the quick, well-structured play and progressive organization on the board. As a Kickstarter supporter, I’m really pleased with the results of Canterbury and I’m glad to have been there to see the kingdom’s development from that lone well in the wilderness. Thanks for Kickstarting Canterbury and thanks again for the overview! Hope you continue to enjoy the game.